Home/Education/What is Supplemental Life Insurance? As a component of the employee benefits package, most companies offer supplemental life insurance or other ancillary coverage. Some examples include life, disability, vision or even dental insurance. 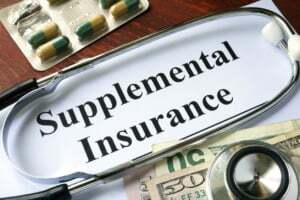 Many workers in the USA today have supplemental or additional life insurance benefits available through the employer for either little or no charge. This life insurance is beneficial when it comes to family protection. Nonetheless, before enrolling there are a few things worth knowing. Employees with a workplace life insurance policy have to know what exactly is included in the plan, the policy limits, and the extent of the death benefit. Most employer-sponsored life insurance plans amount to twice the employee’s yearly salary. For instance, workers who earn fifty thousand dollars are offered a one hundred thousand dollar policy by the employer without any costs. Nonetheless, employees with young families have to reach almost five hundred thousand dollars to achieve the necessary coverage. That limit may not be sufficient to cover all the financial requirements in the unfortunate event of death of an employee, or their loved one. In most cases, the life insurance offered by the employer is an AD&D insurance policy, and not a regular life insurance policy. The AD&D policy provides benefits for the family after death caused by accident. And while AD&D benefits range across the insurers, most insurance providers also offer compensation benefits when the employee or family member loses eyesight, a limb or hearing due to the accident cover. In most cases, this life insurance is a form of burial insurance policy. Usually the plans have flat associated benefits. And coverage amounts can range from five to ten thousand dollars each, depending on the employer’s contribution. The main aim of this life insurance coverage is to provide the employee’s family with sufficient coverage for funeral expenses. In the US, some employers allow employees to buy this life insurance cover for the worker’s domestic partner or spouse. In this case, the policy complements the worker’s term life insurance coverage. But there are a few restrictions, depending on the type of employer. While most employees would like to work for a single company, the plan doesn’t work well in reality. In the US, an employee works an average of only five years with a single employer. As such, when employees leave or resign jobs, this life insurance is canceled. This implies that employees have to re-appeal for brand-new coverage at the new job or singly from a life broker or company (based on the employee’s health status and age). It’s not a pressing concern; the only problem arises when particular health complications obscure the employee from qualifying or finding an affordable plan. In the US, a lot of employer-supported life insurance policies are not transferable. Hence, the employee cannot take the plans after quitting the job. Employees with a workplace life insurance need to understand whether there’s the alternative of paying an extra premium to their benefit. In case it’s not possible, the employee may want to consider engaging an insurer outside of what is provided at work.